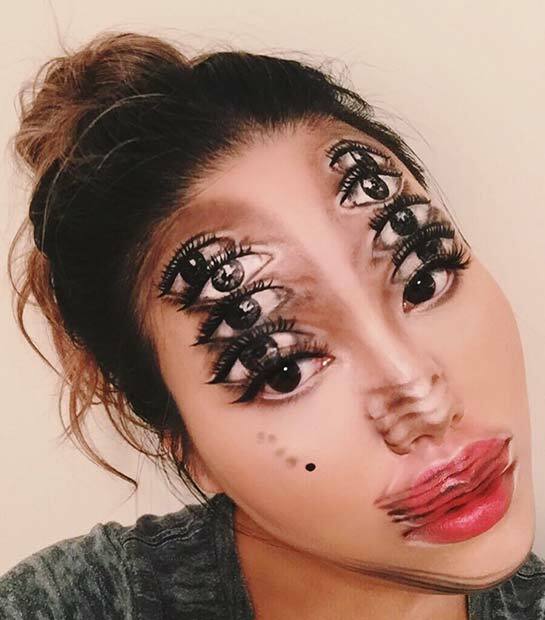 Looking for Halloween makeup ideas but want designs that are unique? Then search no more as you are in the right place. 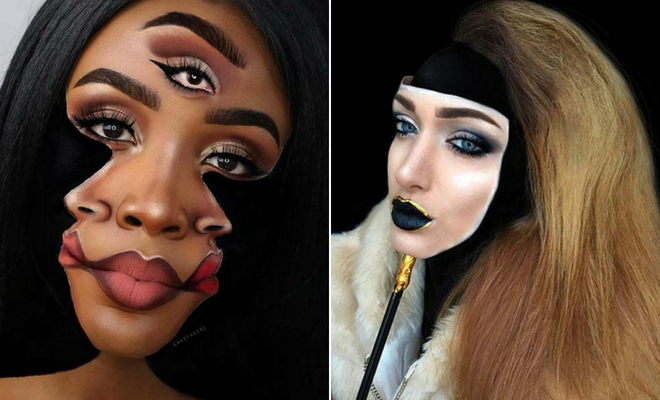 We have found 23 trippy illusion makeup looks for Halloween. 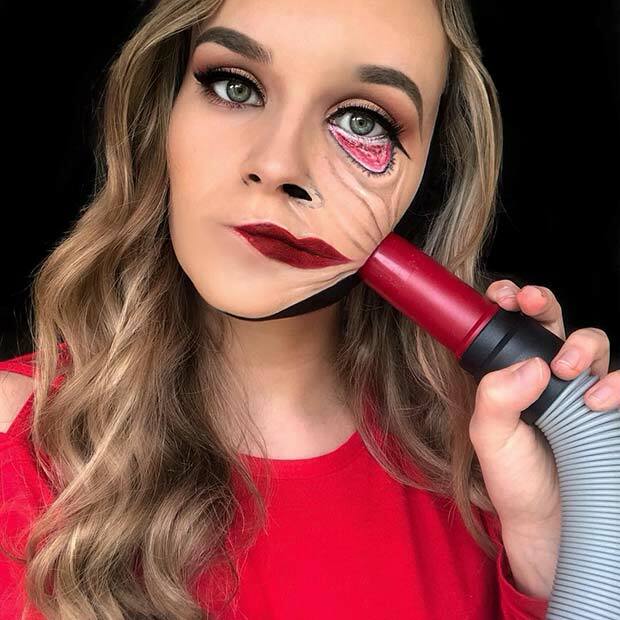 Illusion makeup is a great choice for Halloween as it can transform your face into many weird, wonderful, spooky and scary things using only makeup. We have something for everyone, from masks to upside down faces. Take a look and prepare your makeup bag. The first illusion idea we have to share with you is this mask design. 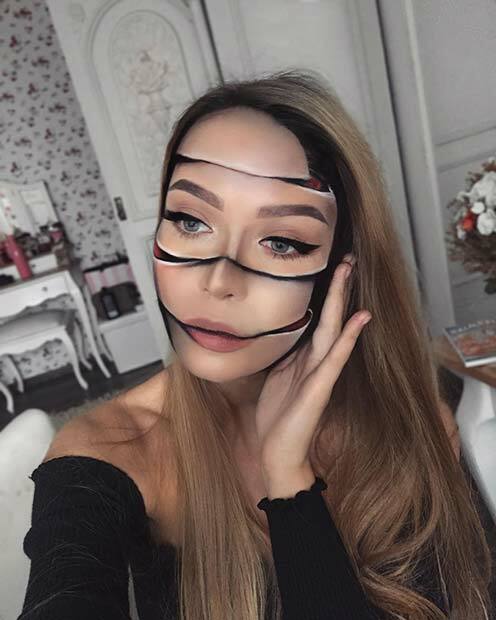 The artist has created the illusion that she is wearing a mask of her face. Not only that but she has added in cracks and made it appear as though the eye has fallen off. 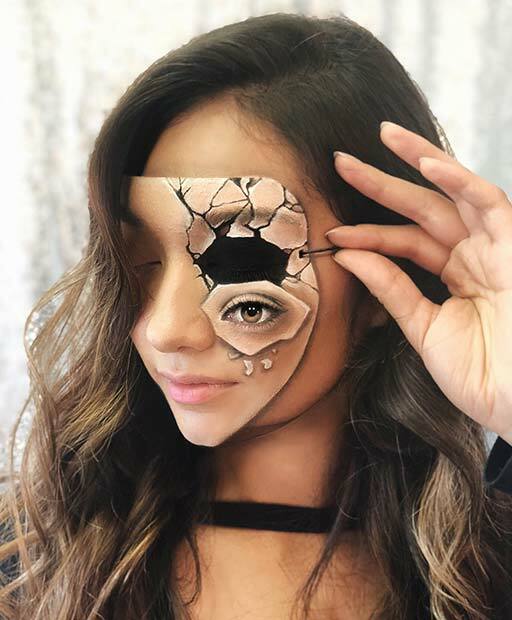 Illusion makeup like this is creepy and is perfect for Halloween. Our next idea features an illusion that will make everyone look twice. 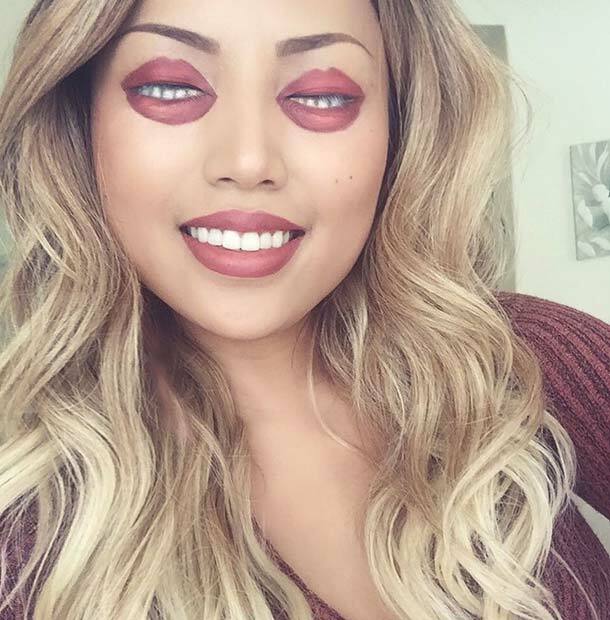 This makeup artist has created half a face design. One half of her face is normal while the other side appears to be upside down! The eyebrow has been drawn below the eye with a mouth and nose drawn on her head. This is an awesome makeup idea and you can recreate this with any design. Try pretty upside down look like in the image or something scarier for Halloween. Tutorial for the look is down below! 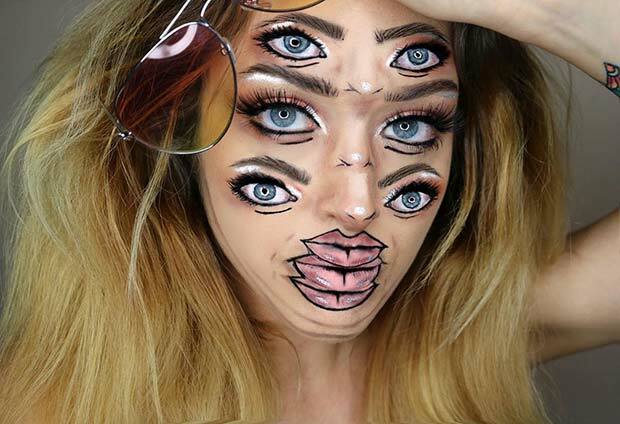 Next, we have a very trippy makeup idea that features lips and teeth over the eyes. As you can see, the artist has created the illusion that her eyes are actually smiling mouths. What makes this really freaky is that the mouth designs match her real mouth so it really confuses you when you look at it. We love this one! Looking for a unique illusion idea? Then this next design is perfect. 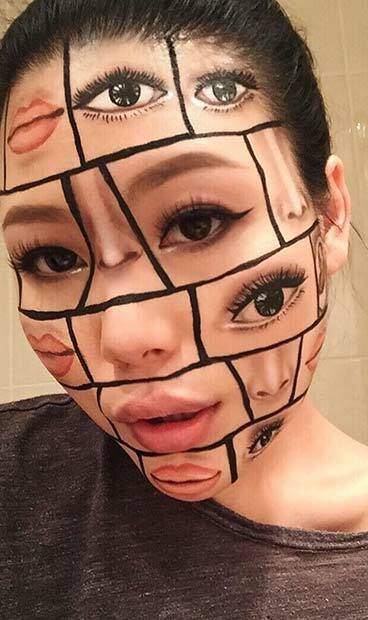 Here we have an illusion that makes it appear as though her face is being sucked into a vacuum. It is a fun design that makes you think twice about using the vacuum cleaner. You can recreate this look with any makeup on the eyes and lips. No you are not seeing double, it is just a double vision illusion makeup! This artist has created another set of her facial features using makeup so it appears as though each one is on her face twice. If you wore makeup like this to a Halloween party, it would freak everyone out. It is a makeup look that will definitely be remembered. Next, we have another illusion idea involving facial features. For this look, the face has been transformed into sections with black makeup. Inside each section is a facial feature, some are real and the others are not. Makeup like this would be so trippy at night or in the dark because the black makeup will blend, making it look more real and confusing when people look at your face. Our next illusion idea appears as though the face is moving. The artist has created many sets of her eyes, lips and nose which it gives a still frame look. It is like you are watching her jump or move in slow motion so you can see each movement. We love this trippy and unique design. 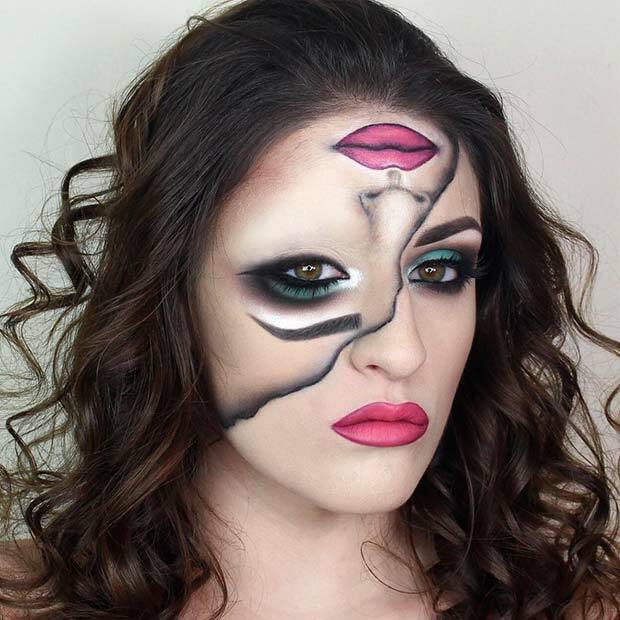 If you really want to cause confusion with illusion makeup, then this idea could be just what you are looking for. This design features three eyes, noses and mouths with black makeup around the outside. The black makeup has completely transformed her face into a different shape and it would look amazing at a party in the dark. Recreate something like this or use makeup to create a different face shape. We have seen double vision now what about triple? This design features three eyes, noses and mouths. It creates such a weird and wonderful effect that people will have to look twice to find out which of the features are real. You can recreate this makeup or choose darker makeup for Halloween. 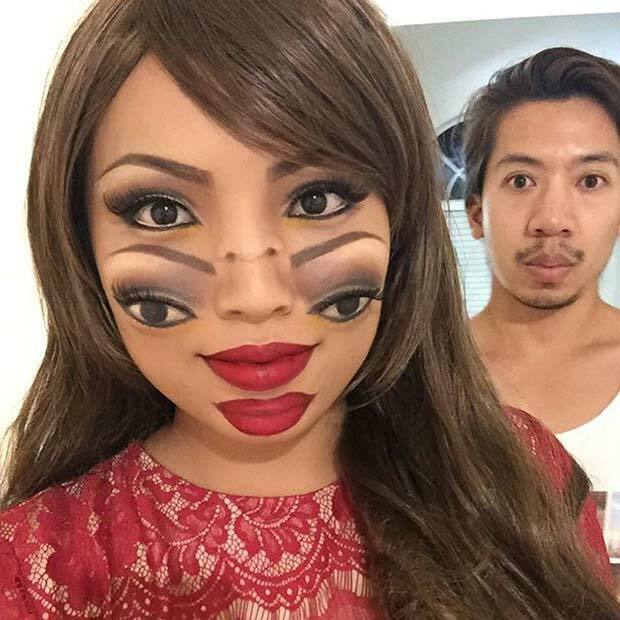 Next, we have a creepy illusion makeup idea. This one features a sliced face. 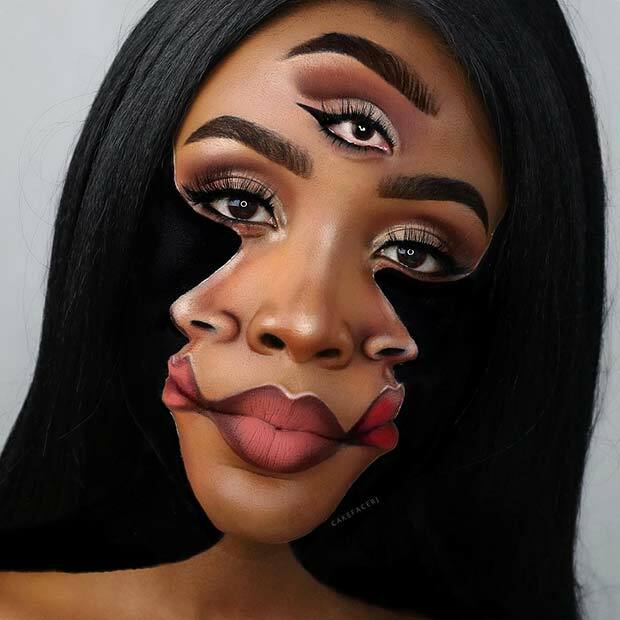 The artist has used black makeup and other colors to create the illusion that her face has been sliced into different sections. Makeup like this would trick everyone in the dark and you can even make it gory by adding some fake blood. This look is perfect for Halloween!